The Abortion Rights Campaign welcome Minister Harris’s commitment to ensuring that people from Northern Ireland will be able to access abortion services in the Republic. Although this is a welcome step, this is not a solution to the lack of abortion access in the North. Women and pregnant people who travel for abortion care face practical and financial barriers; although these barriers will be lessened by travelling to Dublin rather than Liverpool, they still exist. Minister Harris’s commitment will provide another option for those who are able to travel for services, but many will be unable to travel and will be forced to continue a pregnancy against their will. In addition to legal and practical barriers, pregnant people in Northern Ireland have often faced criminal sanctions for accessing abortion. The people of Northern Ireland deserve free, safe and legal abortion within their own jurisdiction, with local care and support. It is vital that abortion is fully decriminalised in Northern Ireland and that safe, accessible abortion care is introduced. The Abortion Rights Campaign reminds Members of the Legislative Assembly that it is to the shame of successive members of the Oireachtas that people of this island have had to travel in their thousands, and continue to do so, for care that should have been accessible here. It is time that they, like their Dáil counterparts, recognise their failure and start to provide care to pregnant people in their own communities. We would also remind the Minister that this helping hand should not be restricted on the basis of residency status or nationality but provided to all who need it as a matter of urgency, after decades of failing women and pregnant people. 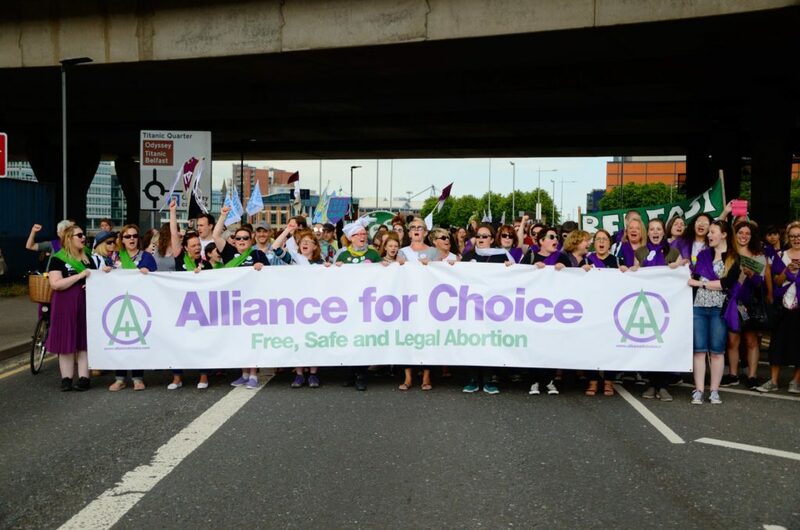 At the 7th Annual March for Choice on 29th September in Dublin, Emma Campbell and Kellie O’Dowd of Alliance for Choice will speak about #decrimNi and the all-island fight for access to free, safe and legal abortion.